Posts Tagged with: "Run Clinic"
ATTENTION TBR DREAM MARATHONERS! It’s our last Bull Session this coming Saturday! How time flies! Hope to see you there! NOTE: If you have your MEDICAL CERTIFICATE already, we will accept submission during this Bull Session. Give it to our staff at the registration booth. Click HERE to mark other important dates to remember! Mizuno Run Club, headed by Coach Ige Lopez, is back! Sessions begin on March 26, 2009, every Thursday at Mizuno, Bonifacio High Street. 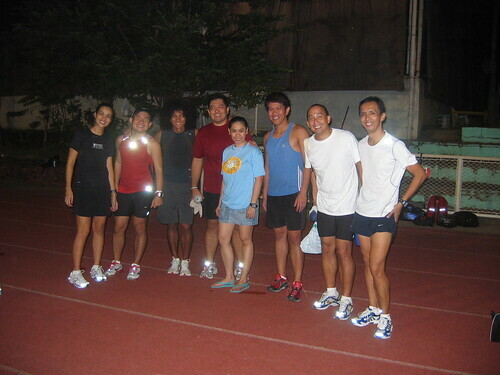 It’s a 10-week training program leading up to the Mizuno Inifinity Run on June 7, 2009. The run club is open to all runners. But, they are now offering the MIZUNO RUN CLUB MEMBERSHIP to those wearing Mizuno running shoes. If you attend regularly, you get the chance to receive special perks such as free drinks, gift certificate, singlets, and a Mizuno Loyalty Card. Silly me for thinking I could do an easy 10k during Day 3 of Nike Run Clinic. My training at Ultra last night was quite the opposite. After the usual warm up and stretching, Coach Rio asked the group two questions: 1) who had injuries, and 2) who was going to run at Singapore; both times I raised my hand. We were then divided into groups during which my bullheaded self requested permission to cross over to the uninjured group instead. Coach Rio and Jo-Ar obliged telling me to simply stop should I encounter any pain. In a few words, that workout was lung-busting, vomit-inducing, and really tiring, but it was a lot of fun. I also picked up a few tips from Coach Rio and Coach John who took note of my “lazy wrists” and helped me correct my form. I ended the run without injury but Coach Rio advised me to continue with the ice—not in my drink, Mark—but on my knee. I must say that I don’t enjoy intervals as much as long runs, but I always end track workouts feeling proud of myself for merely being able to walk back to my car alive and well. I’m so looking forward to Nike Run Clinic Day 4. Tempo Workout, here I come! Thank you to the wonderful coaches: Rio, John, Jo-Ar and Roel and the rest of the team. To promote the love for running and to help those who are already in love with it, Nike is starting a training clinic for runners. 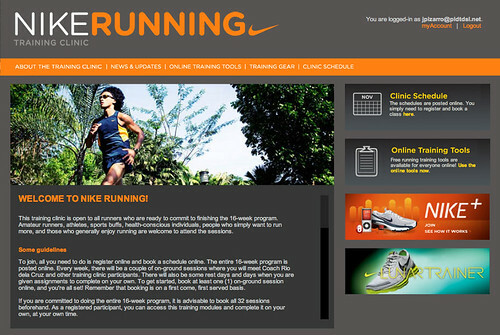 The NIKE RUNNING TRAINING CLINIC offers a 16-module training for beginning as well as advanced runners, free of charge! There will be two training sessions every week, plus scheduled rest days and run-on-your-own assignments. 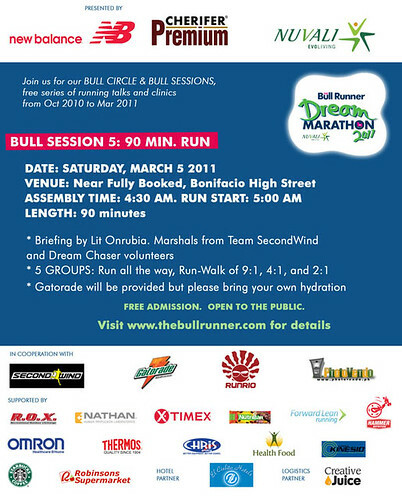 The sessions will be supervised by Coach Rio de la Cruz, himself a passionate runner and an inspiring teacher. Each training session will have a maximum of 100 participants. So registration will be on a first-come, first-served basis. To sign up, click here to visit its cool website. Remember: You have to SIGN UP for a session even after you REGISTER. I’m the 2nd registrant for the Nov. 14 Orientation…I can’t wait!